Dr. Horton is a Professor of Radiology, Dr. Johnson is an Assistant Professor of Radiology and Dr. Fishman is a Professor of Radiology, at The Russell H. Morgan Department of Radiology and Radiologic Sciences, Johns Hopkins School of Medicine, Baltimore, MD. Dr. Heath is President and Mr. Ney is CEO of HipGraphics Inc., Towson, MD. 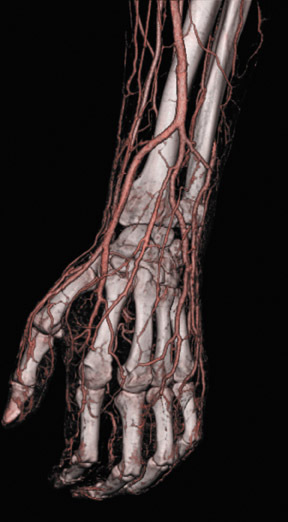 In the past, 3-dimensional rendering was reserved for computed tomography (CT) angiography and orthopedic applications. 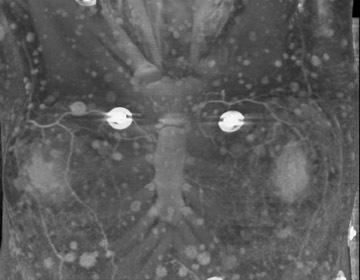 However, coupled with advancements in multidetector (MDCT) hardware, 3-dimensional volume rendering has become an essential tool for assessment of a range of organ systems, including pulmonary, hepatobiliary, genitourinary and gastrointestinal applications, due to the inherent versatility of this robust display technique. 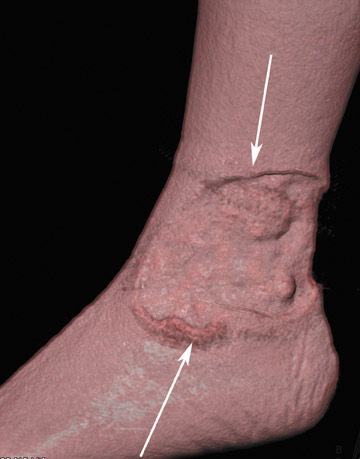 Three-dimensional volume rendering can also provide valuable diagnostic information about the skin, subcutaneous soft tissues and muscle.1,2 Over the past decade, limited applications of skin imaging with CT have been reported in the literature.3–5 Nonetheless, in the authors’ experience it is extremely useful for comprehensive evaluation of skin ulcers, infection/ inﬂammation, trauma, soft tissue tumors, and pre- and postoperative imaging and vascular collateralization. This may have signiﬁcant impact on patients seen in the emergency room setting. 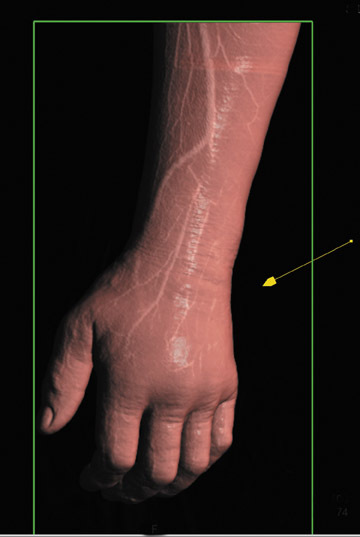 This article explains how to optimize the volume-rendering technique for display of skin, soft tissues and muscle, and it illustrates the clinical utility of this application. 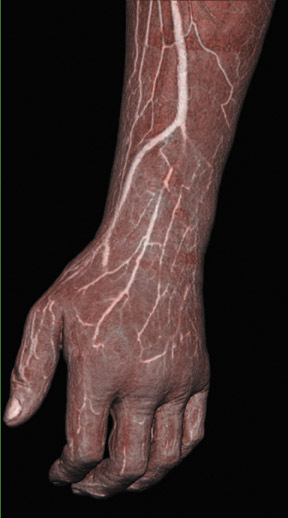 All studies were done on a 64-slice MDCT scanner (SOMATOM Sensation, Siemens Healthcare, Malvern, PA). 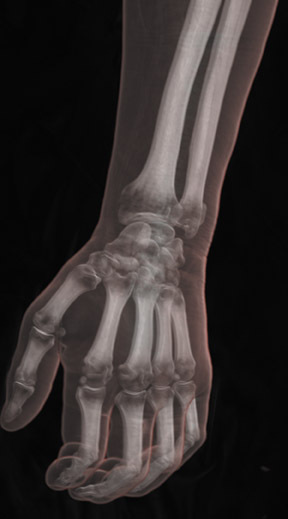 All patients were referredby their treating physicians for a range of clinical indications. Unless contraindicated, studies were performed with intravenous (IV) contrast, either Omnipaque-350 or Visipaque-320 (GE Healthcare, Chalfont, St. Giles, U.K.), depending on the patient’s renal status or clinical history. Injection rate for 100 cc to 120 cc of IV contrast was 4 cc/sec. 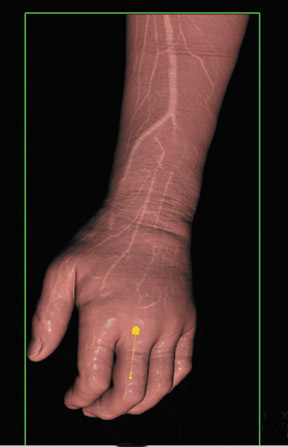 Studies are routinely done using a single arterial or venous phase acquisition although in select cases dual-phase imaging was used. Scan parameters included 0.6 mm collimators, 0.75 mm slice thickness with a reconstruction interval of 0.5 mm. The typical kVp was 120 and the mAs between 120 mAs and 200 mAs. 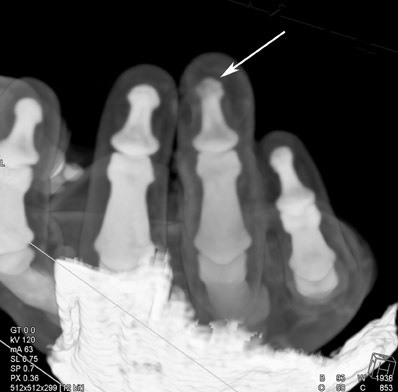 All images were reconstructed with a soft-tissue kernel; the high-resolution bone kernel is not used because the images have increased noise which degrades quality. 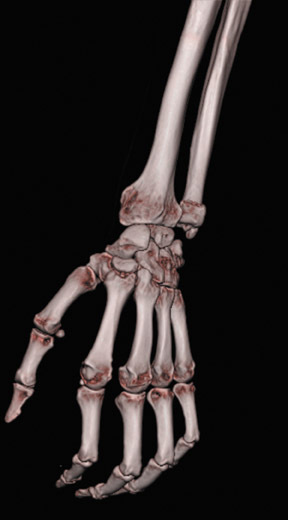 Once the datasets were reconstructed, all images were sent to a workstation (Leonardo running InSpace, Siemens Healthcare) for 3-dimensional rendering by the radiologist. The evaluation of a volumetric dataset is usually done interactively using a combination of axial CT, multiplanar reconstruction(MPR), and 3- dimensional postprocessing with volume rendering (VR) and maximum intensity projection (MIP) techniques. 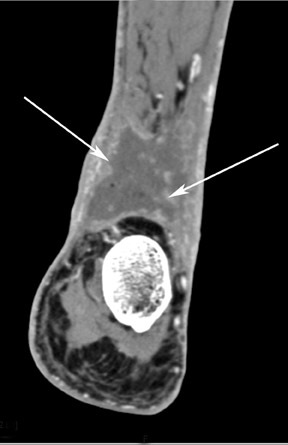 However, for cases requiring soft tissue imaging, volume rendering is the only technique necessary for data postprocessing. Images can be optimized to deﬁne the tissue surface and interfaces. Understanding how to select and adjust the volume-rendering parameters for this type of display and analysis is essential. The size (magnitude) of the gradient is used to modulate what parts of the volume are visualized. Parts of the volume data that have a small gradient are suppressed from the ﬁnal image; this enhances the boundaries between structures. A simulated light source is placed in space, usually relative to the viewing direction. The direction of the gradient vector is combined with the light-direction vector to produce a shading effect in which boundaries facing the light source are enhanced and those facing away from the light sourceare diminished. An effect called “specular reﬂection” can also be used. This lighting effect adds “shininess” to the resulting image. 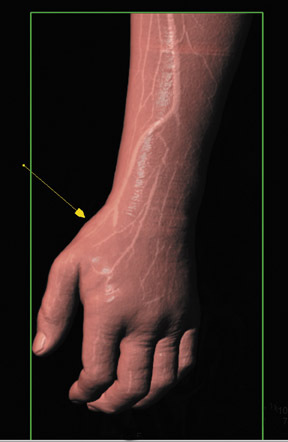 For the surface of the skin, this often enhances the 3-dimensional nature of the image. The shading model is very important for visualizing skin with VR. Unshaded techniques result in images in which the surface is difﬁcult to visualize. Maximum intensity projection is virtually useless for rendering skin. 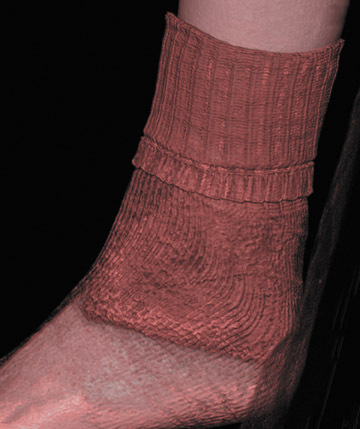 Surface- rendering techniques (such as marching cubes) can make good images of skin. 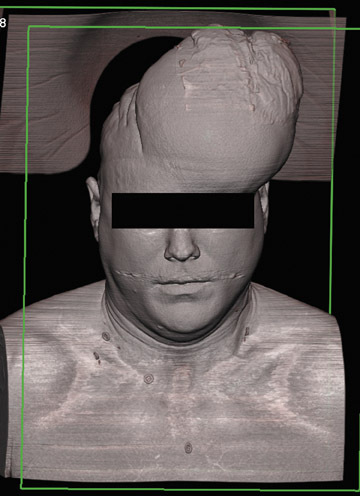 However, volume-rendering produces similar images and has the advantage of allowing the userto melt away the skin and look at structures within the body simply by changing window settings and retaining the high image quality typical of volume rendering (Figure 1). The use of a simulated light source and lighting effects such as “specular reﬂection” enhance the visualization of places where the skin surface is curving. The “curviness” is seen because the simulated reﬂection of the light modulates the color or brightness of the surface over the curving section (Figure 1). Without the simulated reﬂection it would be difﬁcult to see the curves. This is especially true for small features such as wrinkles, nodules or bumps. The fact that there is a high degree of curvature in such features means that the simulated reﬂection will make them visible. 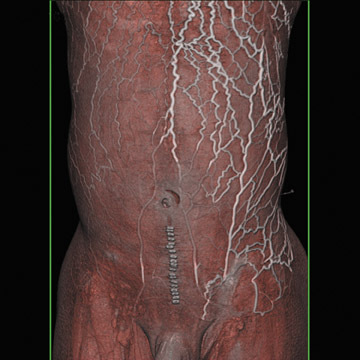 The role of CT imaging of the skin and muscle is best considered part of an in-depth CT evaluation, which would include analysis ofthe vascular map and bone when imaging an extremity or analysis of the liver, pancreas, kidneys, small bowel, etc. when imaging the abdomen. 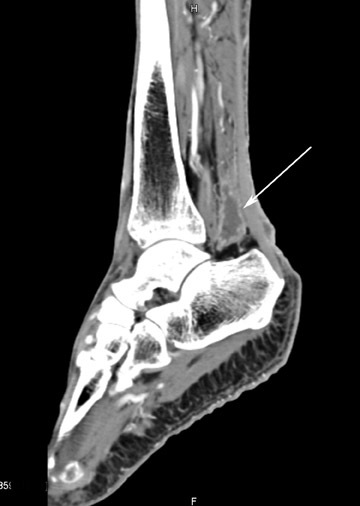 For the purposes of this article, we will focus only on the imaging of the skin, soft tissue and muscle to deﬁne this imaging technique. The list of applications and the illustrated cases were selected for their teaching points. 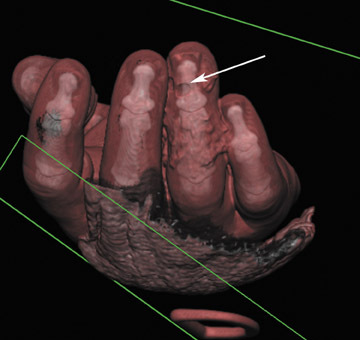 Volume rendering can be used to identify defects, such as skin ulcers (Figures 2 and 3) or sites of puncture wounds. 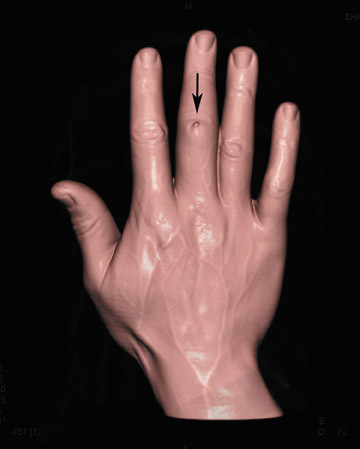 The technique here can delineate changes in subcutaneous tissues in relationship to underlying soft tissue, muscle or bone pathologies. 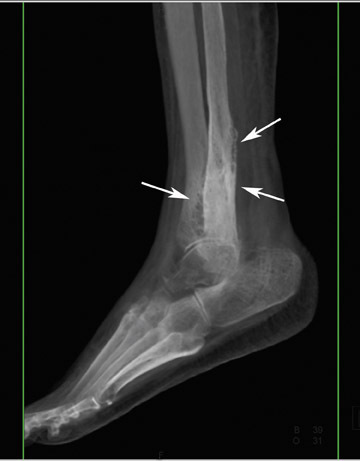 Further, it can deﬁne the location and extent of soft tissue inﬂammation, including abscess (Figure 4) and cellulitis (Figure 5). 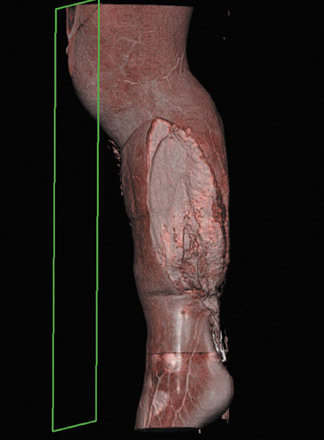 Shaded-rendering VR can also deﬁne skin and muscle injury to elucidate the trajectory of the penetrating trauma or location of blunttrauma (Figure 6). 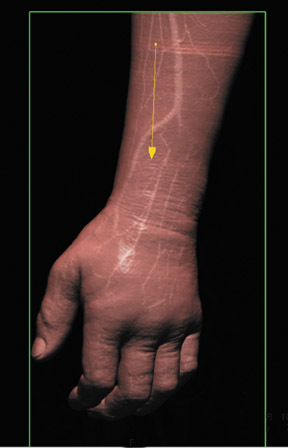 It is helpful in determining the extent of laceration and muscle involvement in complex muscle injury and fractures (Figure 7). 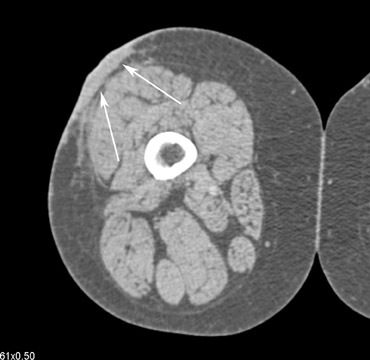 CT techniques allow radiologists to correlate soft tissue injury in relation to muscle, vascular structures and bone. 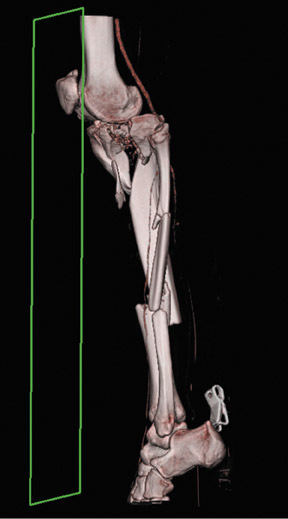 Radiologists can use these CT shaded-rendering VR techniques to examine soft tissue or muscle involvement in relation to underlying bone tumors. 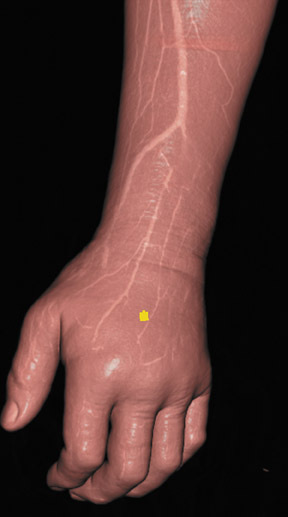 The technique is adequate for delineating neoplasms such as melanoma (Figures and 9), lymphoma and neuroﬁbromas. 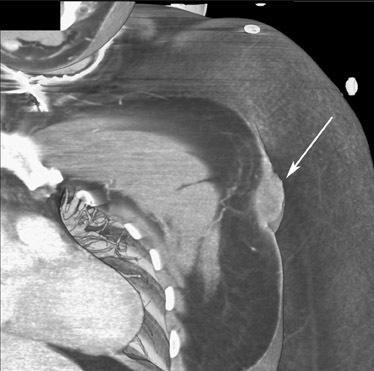 Besides the above clinical applications, CT imaging of the skin can be used to deﬁne the extent of collateral vascular ﬂow in the chest wall and neck (Figure 10). 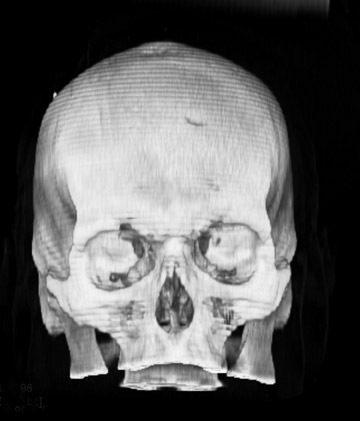 It can also be used for soft-tissue mapping in craniofacial pathology (Figure 11). 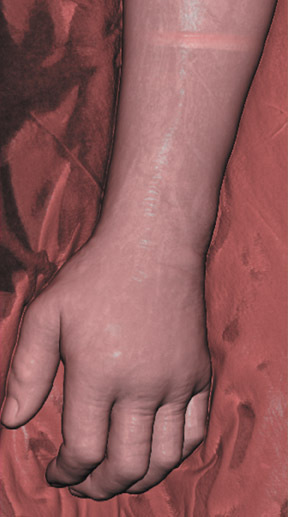 In cosmetic surgery applications, the technique can be combined with anatomic mapping of skin in relation to underlying pathology. 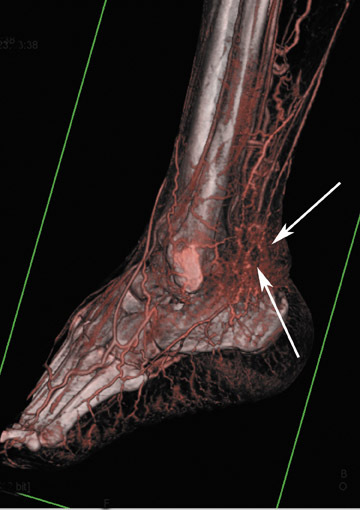 Knowledge of 3-dimensional CT applications may result in broadened utility. 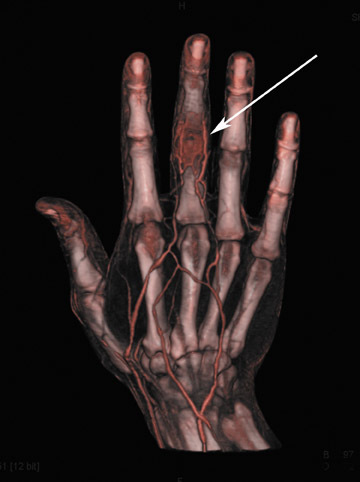 In addition to the clinical applications demonstrated, the possibilities for medical education, as well as patient education, are truly enhanced by these new techniques. This article has addressed one of the new opportunities provided by the coupling of 64-slice MDCT data with advanced postprocessing techniques like volume rendering. 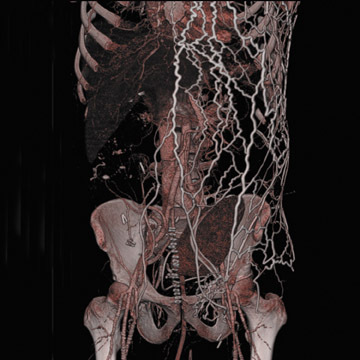 As CT continues to evolve and as new, advanced rendering algorithms are developed, we can look forward to improved image resolution and ﬁdelity. Johnson PT, Heath DG, Bliss DF, et al. Three-dimensional: Real time interactive volume rendering. AJR 1996;167:581-583. Calhoun PS, Kuszyk BS, Heath DG, Carley JC, Fishman EK. Three-dimensional volume rendering of spiral CT data: Theory and method. 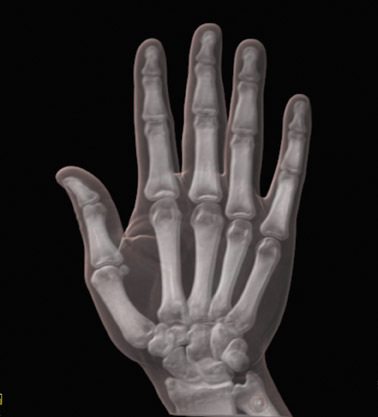 Radiographics. 1999;19:745-764. Vicini FA, Jaffray DA, Horwitz E, et al. 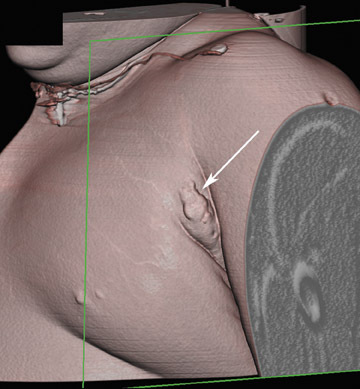 Implementation of 3D-virtual brachytherapy in the management of breast cancer: A description of a new method of interstitial brachytherapy. I J Rad Onc Biol Phys. 1998;40:629-635. Jung C-W, Seao J-H, Lee W, Bahk J-H. A novel supraclavicular approach to the right subclavian vein based on three-dimensional computed tomography. Anesth Analg.2007;105:200-204. Ayoub AF, Xiao Y, Khambay B, et al. Towards building a photo-realistic virtual human face for craniomaxillofacial diagnosis and treatment planning. Int J Oral Maxillofac Surg. 2007;36:423-428. Epub 2007 Apr 10. 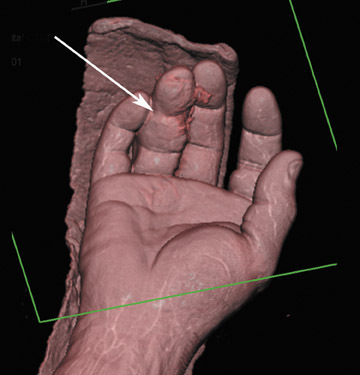 Three-dimensional volume rendering and display of skin and subcutaneous tissues. Appl Radiol.